Hi! My name is Paula Taylor and I love to paint! Throw the party everyone will be talking about for weeks! 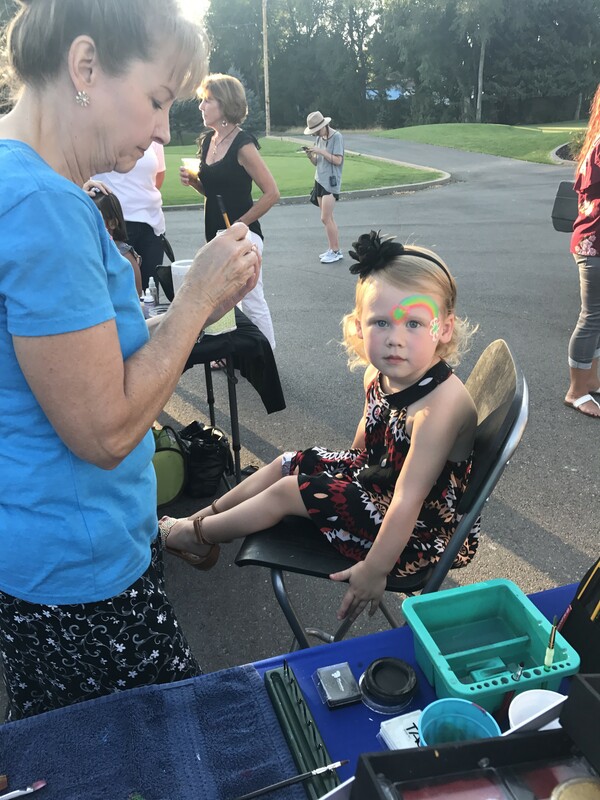 Face painting makes it happen! Make your next party rock with Fairy Fun Faces! 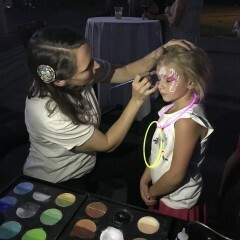 The face painter was terrific! 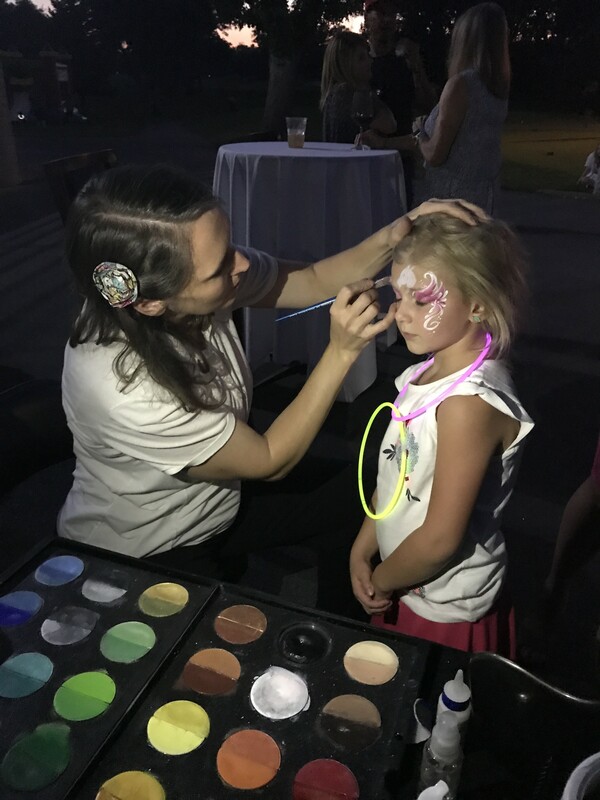 The face painter decorated the faces of around 40 unruly children of various ages at Halloween Party for those temporarily housed at sheltered living. She was talented, friendly, enthusiastic, creative, quick, fairly priced. Highly recommend. It was a pleasure working with you. The party was a huge success, I'm glad I got to join you! Paula was so great to work with from Start to finish! I had her paint my sons faces for some Halloween events and she exceeded my expectations! Her work is amazing! My boys were so happy and they got so many compliments about how great their face paint was! She is so darling with the kids and friendly to work with as well! And to top it off after she was more then halfway home she drove all the way back to fix one of my boys faces. He had a mishap and started crying after she had left and smeared some of his face paint. She was SO nice about it and hurried back and made it look good as new. Can’t say enough good things about her! I would HIGHLY recommend her to everyone! Thanks so much Chelsea! It was a pleasure painting your boys! They were great to work with and the little one was so cute! I'm glad everything turned out alright!! I could not be more pleased with Paula of Fairy Fun Faces. She did an amazing job and had beautify designs that appealed to all the children. We had well over 40 kids at our event and she managed the crowd extremely well. It was so hot that day but the designs held up very well. You should absolutely book Paula. Thanks so much for inviting me! Your right, it was super hot but your party was a blast! Everyone had a great time! I'm glad I got to be a part of it! Paula is amazing at what she does! She is super talented, friendly and professional. Every kid was happy with their cute painted face. Thanks so much for inviting me! You have super cute kids and it was such a pleasure to paint in a more relaxed environment. You gave a wonderful party and everyone had a terrific time! Spiderman was a huge hit too! Incredible job on the kids! They all loved her. The designs were very good! Thanks so much for inviting me! You had so many great activities! The kids had a blast. I'm glad I was a part of it! Amazed !! Highly recommend !! She did an amazing job at my daughters birthday party !! Not only was she on time. She made all the kids and several adults very happy. Her designs are unique and very well done. I highly reccommend her ! You won't regret it. I will be booking her for my other events. Thanks so much for inviting me to your amazing party! You did a wonderful job and I'm so glad I was able to be a part of it! 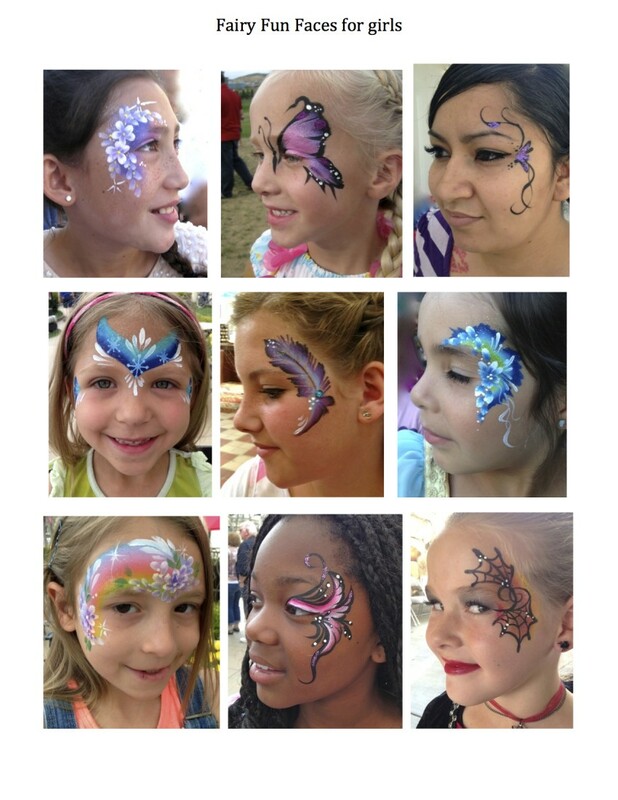 Fun Fairy Faces was so professional and had such great customer service! Not to mention, her amazing talent!! I couldn't have asked for anything better, than what she painted for me. I have very oily skin and my makeup stayed for the entire Halloween party! Thank you so much! Perfect job for childs bday! Shr was awesome! Most of the kids said ot was their favorite part of the party! I would highly recommend her! Thanks for inviting me Michele! The kids were so excited but there was so much for them to do and the party was a blast! They did such a great job! It was perfect for our event!!! Terrific party April! The music was great and the fireworks at the end were so cool! All the kiddos loved their finished faces. Grampa and I ended up with "Batman" faces blue for him and pink (with glitter) for me! Paula was very friendly and brought such a great assortment of pictures to choose from. Very clean and organized. We are planning on having her and her artistic talent back at Halloween. Thanks for inviting me Connie! "Gramps" was a great sport and looked so cute! You did too! Fun party! The line at the event never ended!! Her work was great and she was very professional yet fun. We will be hiring her again! Thank you so much Natalie! It was lots of fun. The kids are a hoot! 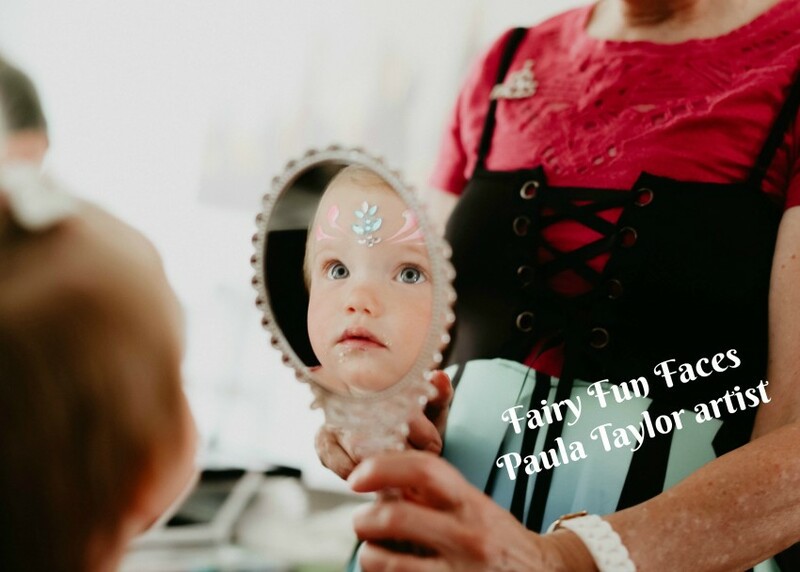 We did a birthday party for a one year old and Paula of Fairy Fun Faces was the main attraction for all the children there... ages one through 14. She worked non-stop the whole hour and made sure that each child got to choose from her fun idea board what design made them the most happy. I can't say enough about her professionalism and artistic talent. It's not just face painting... it's magic :) Thanks Paula. Thanks so much Annette! You really know how to throw a party! All the events and decorations and food were fabulous! I'm glad I got to be a part of it! Thanks so much! Your Halloween parties are a blast! Thanks for letting me be a part of them! So thankful she could come and make the party that much more fun and unique. Thanks so much for inviting me to paint at your fabulous masquerade ball! It was a great time and fun to get dressed up! I use only professional FDA face painting products. I will arrive a few minutes early at your party to set up my supplies and will proceed to delight your guests! Hi! 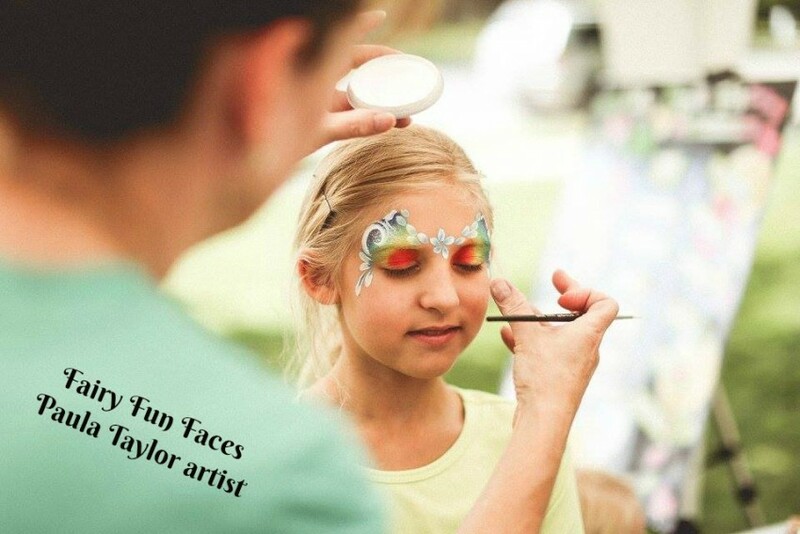 I'm Paula Taylor owner of Fairy Fun Faces creating face painting magic all over the Salt Lake valley. Throw the party everyone will be talking about for weeks! 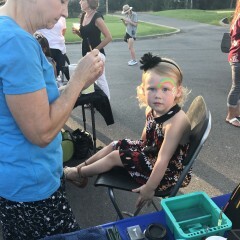 Face painting makes it happen! It's fun, it's silly, it's dramatic, it's beautiful, whatever you want it to be. Make your next party rock with Fairy Fun Faces! I have a Bachelor of Fine Arts degree from BYU and am also a Mural artist, Decorative Painter and Portrait artist. October 31, 2015 • 7:00pm - 8:00pm Salt Lake City 5 - 7 p.m.
October 30, 2015 • 7:00pm - 8:00pm Bountiful 10 - 11 a.m.
October 24, 2015 • 7:00pm - 8:00pm Bountiful 6 - 8 p.m.
October 23, 2015 • 7:00pm - 8:00pm Bountiful 6 - 8 p.m.
October 17, 2015 • 7:00pm - 8:00pm Salt Lake City 5:30 - 7:00 p.m.
October 16, 2015 • 7:00pm - 8:00pm Bountiful 6 - 8 p.m.
For outdoor events I have a canopy and large banner. 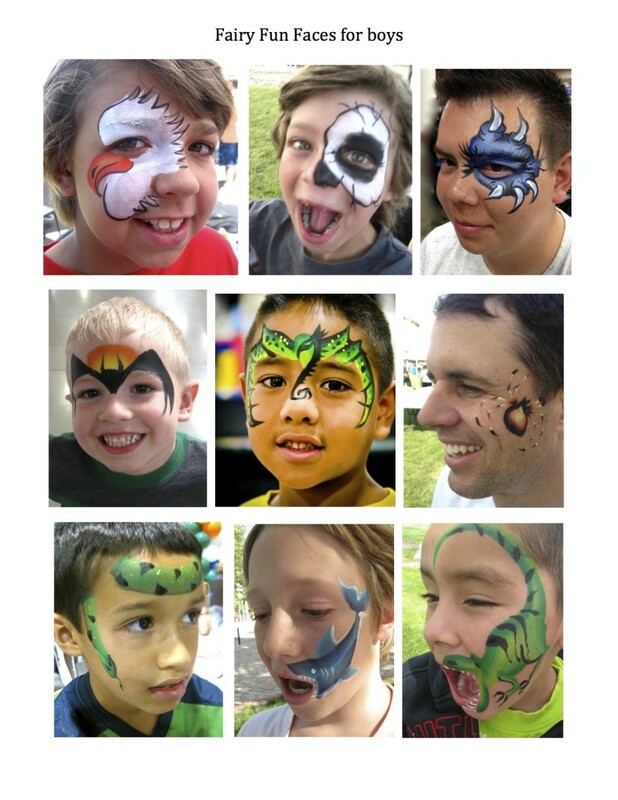 For indoor events I have a table and all supplies needed for face painting.